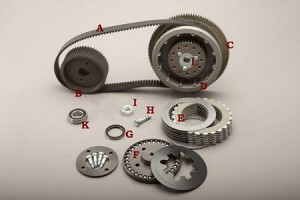 EVB-8SL | Belt Drives, LTD. The EVB drive is one of our original closed primary belt drives. Designed for bolt in application. Our clutch basket features 12 cylindrical replaceable clutch dogs, which allows our clutch plates to maintain constant contact. Our Kevlar clutch plates give the maximum performance, with our new ball bearing pressure plate. This unit includes our own patented Ball Bearing Lock Up Clutch (US Patent #7,686,148 B2). We also include a sealed bearing for the inner primary for 2007-Up Softail® models.